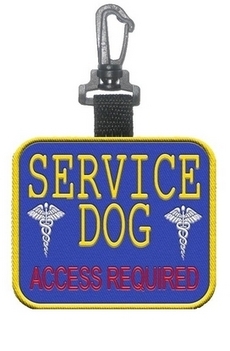 We carry a complete line of Service Dog Vest Accessories including Service Dog Patches, Double Sided Patch Clip-ons, Service Dog ID Badges and Service Dog ID Tags. Service dog patches can be sewn to your vest to identify your dog as a service dog, therapy dog, working dog, police dog, search and rescue dog to name a few. They also can be used to describe the service your dog performs such as, medical alert dog, guide dog, hearing dog, seizure alert dog, diabetic alert dog, PTSD dog, Psychiatric dog etc. Service dog patches can also be used to inform others that your dog is working do not pet him, that he is friendly and it is ok, or to ask first. Clip-on double sided patches are great for adding quick identificaiton to a vest. Clip-ons can be attached on the service dog vests d-ring, collar, harness, carrier or bag. Service Dog Product Bundles is an easy and affordable way to get all the most purchased service dog supplies at a discounted price. 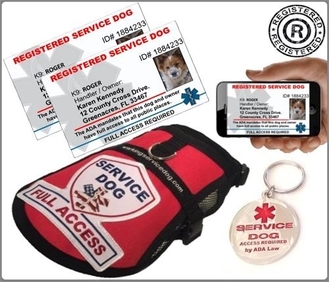 All packages include a service dog vest, ID card and registration into our database. 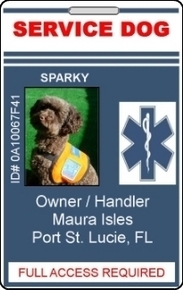 ID Badge gives your dog credibility by clearly stating that your dog is a Service Dog. ID Badge normally have your dog's photo along with the handler information. The Department of Transportation lists identification cards at the top of their list and only verbal assurance is at the bottom. Many owners of service dogs have reported that the airlines have required some sort of identification even though by law they are not allowed to do this. You are NOT required by law to carry an ID Badge, however, they can dramatically speed up your process of getting through airport security, etc. without arguments or confrontations. Service Dog ID Tags are easy to attach to the dog's collar, harness, carrier or vest. Available in many different syles, shapes. 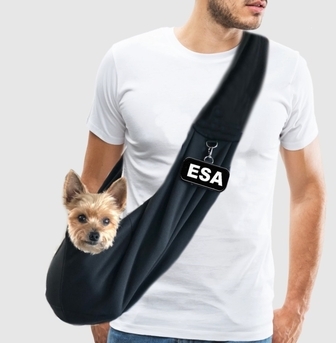 Great way to identify your service dog.